How Much Is A Whale's Life Worth? You have not lived until you have risked your life so that others may live. If Sea Shepherd holds the position that a whale's life is worth risking our own lives, we must also hold the position that it is worth investing whatever we must to protect the lives of whales and dolphins. It also means we must face, overcome and accept all consequences of our actions of compassion and our concern for the survival of bio-diversity in the ocean. Global Sea Shepherd organizations have launched ten campaigns to the Southern Ocean since 2005; Sea Shepherd USA participated in eight of them. Those ten campaigns cost an average of $2 million each, meaning that Sea Shepherd organizations worldwide have invested more than $20 million dollars towards protecting whales. Operation Relentless (2013-2014): 784 whales saved In total, that's 5,367 whales saved. And when you consider that more than 50 percent of the whales killed have been female and many have been pregnant, the number of whales saved is even higher. 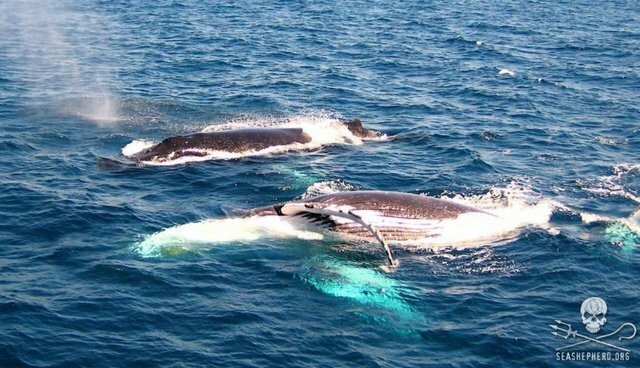 The campaigns resulted in not a single humpback whale being killed, despite humpbacks being on the quota list. And less than 10 percent of the fin whale quota was taken during the past decade. The Sea Shepherd campaigns contributed to the decision by the Australian Federal Court to issue an injunction to Humane Society International Inc. in 2008 against the Japanese whalers for killing whales in the Australian Antarctic Territorial Waters. The Sea Shepherd campaigns contributed to the decision by the International Court of Justice in The Hague to rule that Japan's so-called scientific whaling operation was bogus and illegal. The Sea Shepherd campaigns produced six years of the television program Whale Wars that sent the message of defending whales to an international audience of millions of people. And now Japan has been forced to scale down their plans to a quota of 333 whales, and although they intend to kill whales for the 2015-2016 season, they will be doing so in continued violation of international law. Sea Shepherd took on one of the most economically powerful governments in the world to expose their illegal activities and to physically save the lives of 5,367 whales in the internationally established Southern Ocean Whale Sanctuary. This was never intended to be easy. It was however intended to be effective.